Is your company’s safety team a one-employee operation? If so, you know how tough it can be to stay organized, stay compliant and implement effective changes. OSHA fines are at an all-time high, however, and even if your company is trying to keep personnel costs low, it’s more important than ever to optimize your safety processes and avoid costly mistakes. Fortunately, there are several steps you can take to get a greater return on your timeinvestment. By focusing on the biggest bang-for-your-buck activities, you can provide for a safer, more productive workforce without incurring significant costs or hiring new personnel. Here are 7 tips to help you do just that. Unless you’re running a small farming operation, OSHA probably has jurisdiction over your organization. The oft-cited “rule of ten” is a bit of a myth, as well, given that it only exempts the tiniest of companies from certain record-keeping rules. That said, OSHA does have different standards for different industries, namely agriculture, construction, general industry and maritime. To ensure you’re not wasting time on rules that don’t apply to your specific organization, review OSHA’s industry-specific laws and regulations. Seemingly simple (and certainly low cost) cleaning measures can have a tremendous impact on your workers’ safety. For instance, limiting dust and appropriately storing combustibles can significantly reduce fire hazards. Likewise, clearing clutter reduces the likelihood of lacerations and injuries due to falling objects. Slips, trips and falls are the second leading cause of fatal and nonfatal injuries alike, according to the Bureau of Labor Statistics, and fall injuries result in approximately $70 billion in US workers’ compensation and medical costs every year. You can eliminate the vast majority of these costly hazards with anti-slip mats, blind spot mirrors, drip pans and consistent leak reporting and clean-up. If your budget allows, you might also consider replacing worn or damaged flooring–an investment that will pay off tremendously in the long run. Even if you’re flying as a solo safety team, you can get plenty of help in reducing accidents and injuries. Assign other teams safety-related tasks, including clean-up, hazardous materials control and personal protective equipment (PPE) maintenance. Also, encourage workers to report hazards, so you can act as quickly as possible. Ultimately, getting help will generate buy-in, improve safety and make your job easier–a win-win for everybody. Of course, generating buy-in also requires that you make new rules known to the employees they affect. To secure the help of the other teams in your organization, discuss your policy changes and safety-related goals during training and toolbox talks. Just as importantly, make that information readily available at all times, particularly to the managers and supervisors who can relay it to their teams. As a one-employee operation, you need to focus on the changes that will have the greatest impacts on worker safety and OSHA compliance. To do that, you’ll need to know which job sites, teams and tasks are subject to the greatest hazards and most frequent incidents. Ultimately, recording incidents and tracking trends will be your key to success. 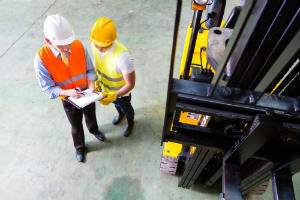 Even for a small company, manually recording accidents and injuries can be a logistical nightmare. Add in JSAs, audits, training management and more, and there are simply too many variables for one employee to track by hand. With a comprehensive safety software suite, however, even a solo safety team can effectively manage an ever-growing collection of documents and forms. Just as importantly, a central, digital repository of your company’s incident information makes tracking a breeze. With the ability to filter by team, task, worksite and more, you’ll be able to quickly pinpoint the areas where new policies and procedural changes will have maximum effect. Being a solo safety team has its difficulties. With the right resources, however, you can succeed as a one-man show. Learn some tips from other safety managers in our free eBook, 9 Ways to Make Your Job as a Safety Manager Easier. Download it today!